In order for your SQL Server instance to run optimally, there are many SQL Server best practices that you need to follow. The SQL Health Check that you can have us perform on your instances looks at many of these. SQL Server 2016, which at the time of this writing is in a Release Candidate 0 state of readiness, has been changed to handle several of these best practices. This post will look at several of these changes. 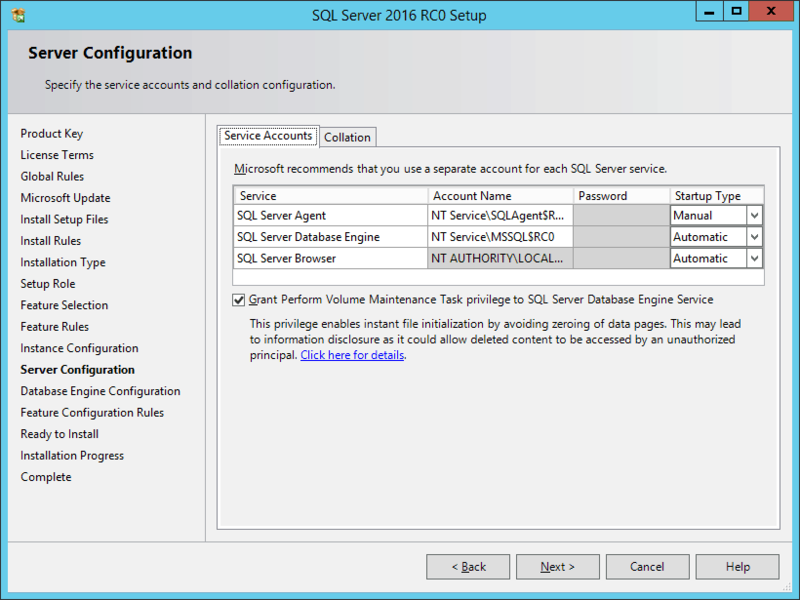 The first change appears during the installation of SQL Server 2016 itself. One of the best practice items that we look for in our Health Check is that the SQL Server Database Engine service has the “Perform Volume Maintenance Task” security privilege. SQL Server 2016 now allows the setting of this privilege right in the install screen. The benefit of having this privilege set is that it allows SQL Server to utilize “Instant File Initialization” (IFI). When IFI is not set, then any growth of a database’s data file will be zero-initialized… that is, the entire growth portion of the file is overwritten with zeros (note that database log files are always zero-initialized… this is needed for the crash recovery process). During the time that the database data file is being zero-initialized, no other activity can occur in the database. This setting not only affects growths of data files, but also affects database restores and adding new files to a filegroup. Kimberly Tripp has an excellent post that explains this in more detail, and the kind of performance impact that can be obtained by having IFI enabled. However, configuring the instance to utilize IFI has a potential negative security side-effect. If you have just dropped a database, and a growth occurs on another database, it could use the part of the drive that the other database was using. And although it is extremely unlikely, the pages could possibly line up. With advanced techniques, one could then read the data that was on those pages. Obviously, zero-initializing the pages would eliminate this problem. It is also obvious that there are a lot of circumstances that have to line up to allow this potential security issue…but the chance of it occurring will never be zero with IFI enabled. Because of the performance impact, and extremely low security risk, most SQL Server professionals recommend having this option set.